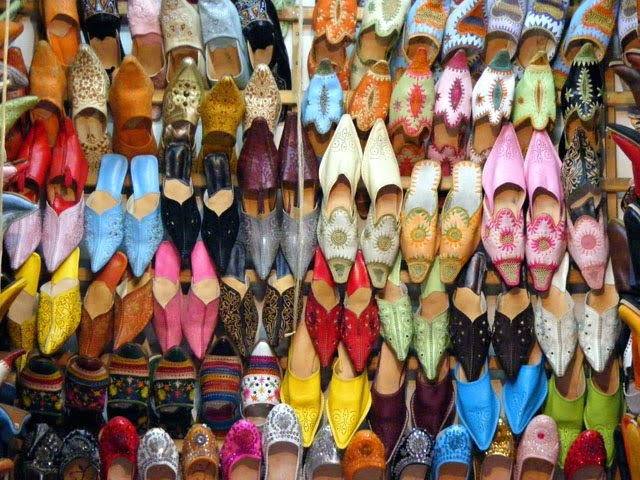 Not knowing where to go after Spain, but looking for some place cheaper than Western Europe, we decided upon Morocco after a shining recommendation from Maggie's host sister Marghe. Neither of us had ever stepped foot on African soil, so we decided it was the right choice to continue our continent-hopping. 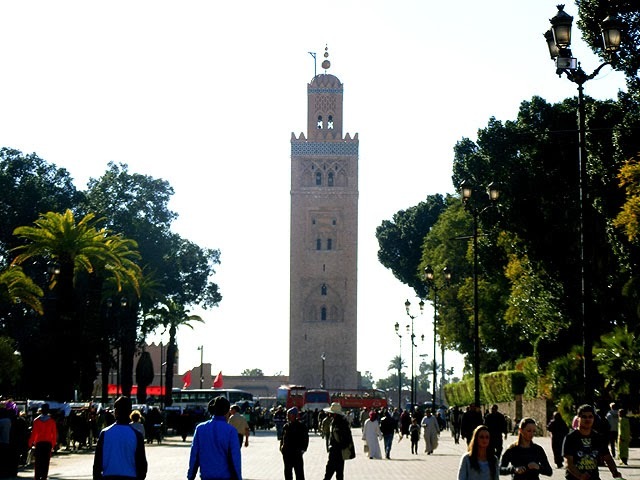 We flew into one of Morocco's major cities, Marrakech. It was pouring rain the day we arrived so we found accomidations in the Medina (city center) very quickly and stayed indoors. Luckily the next day was much nicer and we went searching for nicer accomidations as well. 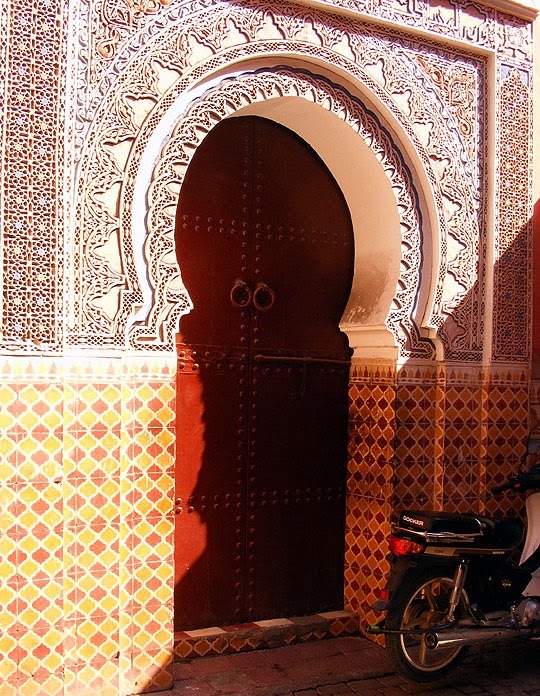 Marrakesh hotels--at least the traditional ones, called riads--are very cute, with all the rooms centered around a courtyard with a open roof. The one we found also had a nice deck on the roof that you could sit and eat at - or work. After settling ourselves in, we headed out to explore the city. 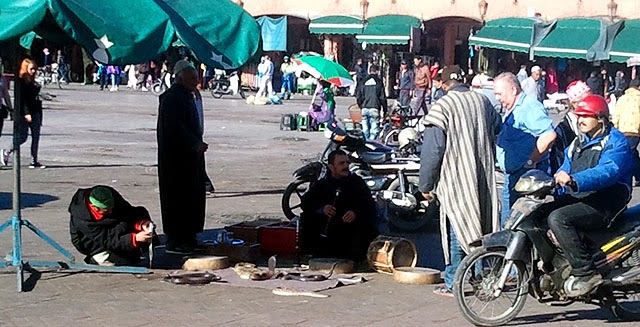 Marrakech is an ancient town with habitation going back to the B.C.'s. It's called the Red City for obvious reasons and for moments you almost felt like you could be in Santa Fe with all the stucco. We were staying in the old part of the city, but we occasional made excursions into the new city to find grocery stores and other new world conveniences. The Atlas mountains in the distance. 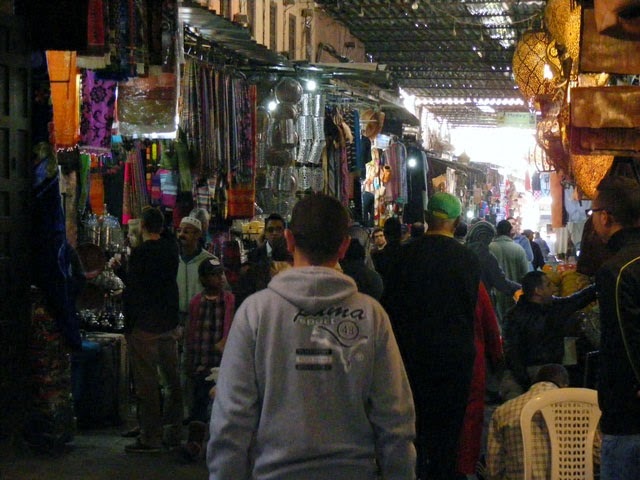 The old walled city we were staying is a hodgepodge of souks (markets), each on leading to the next. 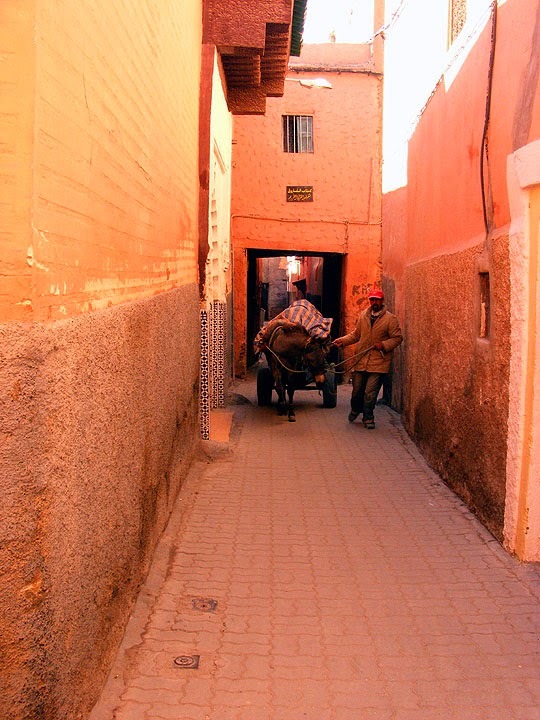 It was easy to get lost wandering the tight, twisting streets. But there was always so much to see. I don't know why so many people sell these. I thought Aladdin was from the Middle East. 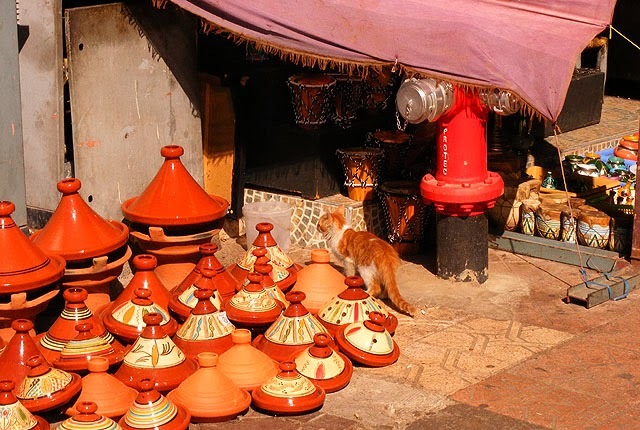 A kitty perusing the tajines, a device they cook much of their food in. 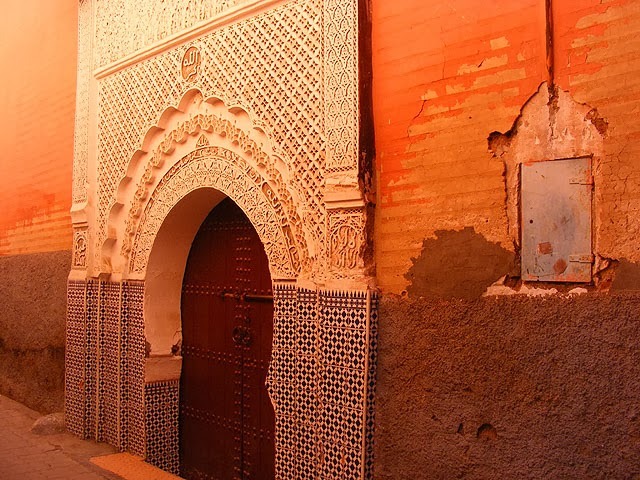 We didn't know what to expect from Moroccans, but we were instantly overwhelmed by how nice and hospitable they all were. 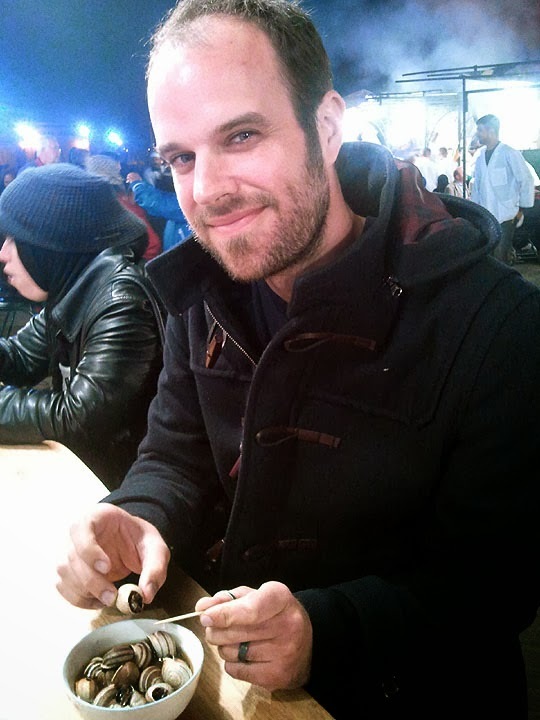 Their vendors can be a little pushy, but overall, they are a genuinely nice group of people. 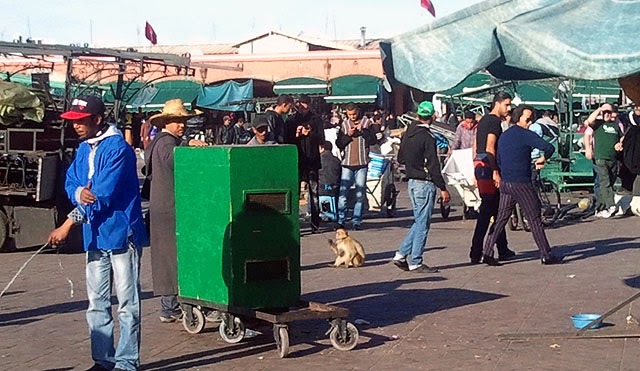 One thing that went on a lot in the Medina was snake charming and monkey handlers. I understand that people got to make a living, but neither of us wanted to encourage the practice, hence the bad quality photos from afar. 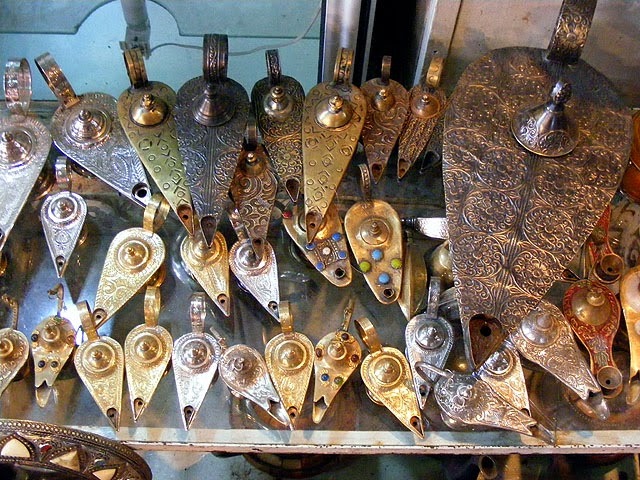 A popular dish in the Medina was snails. So we had to try it. It wasn't great, but we are glad we at least gave it a try. 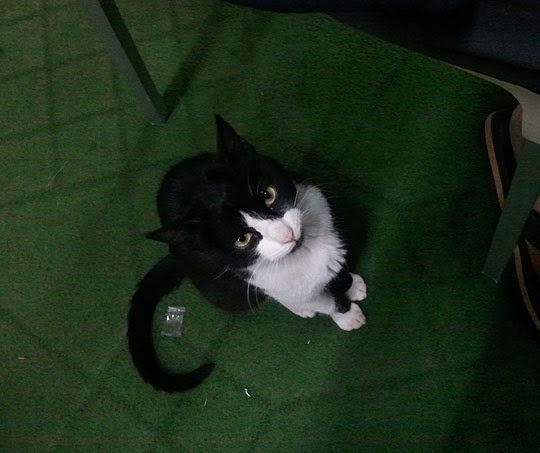 In Morocco, a constant companion while eating is a begging cat. 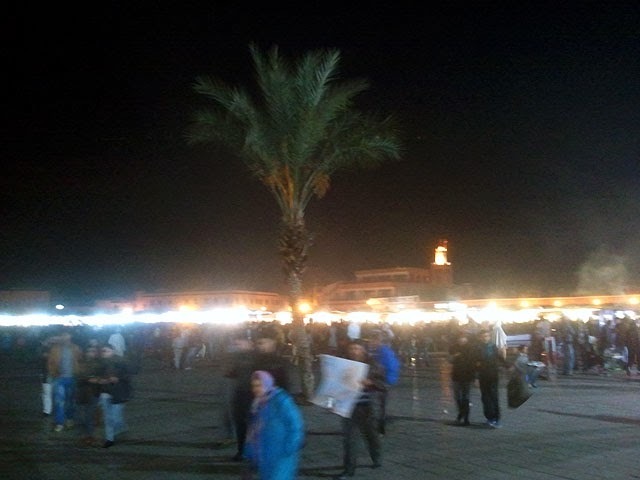 At night the Medina really got going with restaurants, cake shops, nut vendors and a million other things going one. It was quite the spectacle. 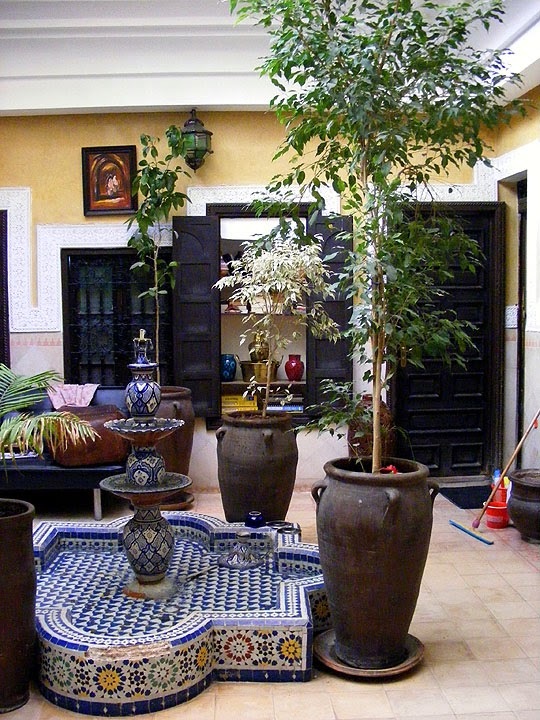 We stayed in Merrakech for a while, so we found some nice places to go and work. 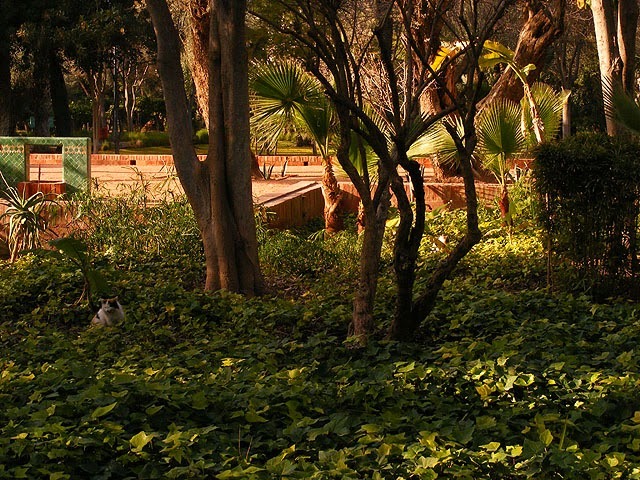 One was a park just outside of the Medina that was full of cats (not much different than the rest of Morocco). It was a very peaceful place where you could find a quiet spot and work while basking in the sun... and watch the cat society play out. How many cats can you find in this picture? Seeing that courtyard makes me wish I lived in a different sort of climate. 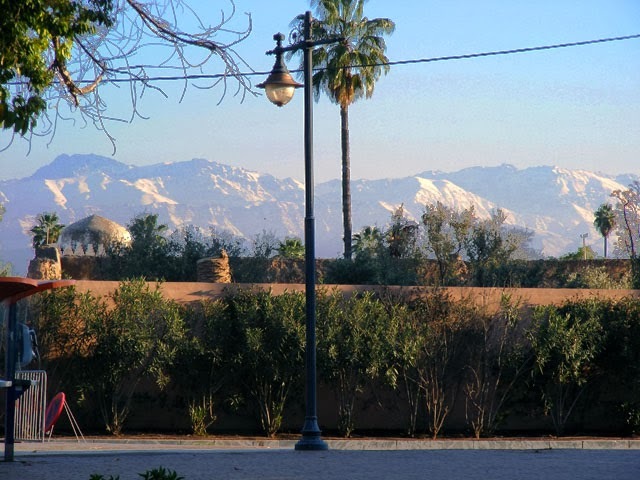 Loved the photo of the mountains with the palm tree in the foreground. 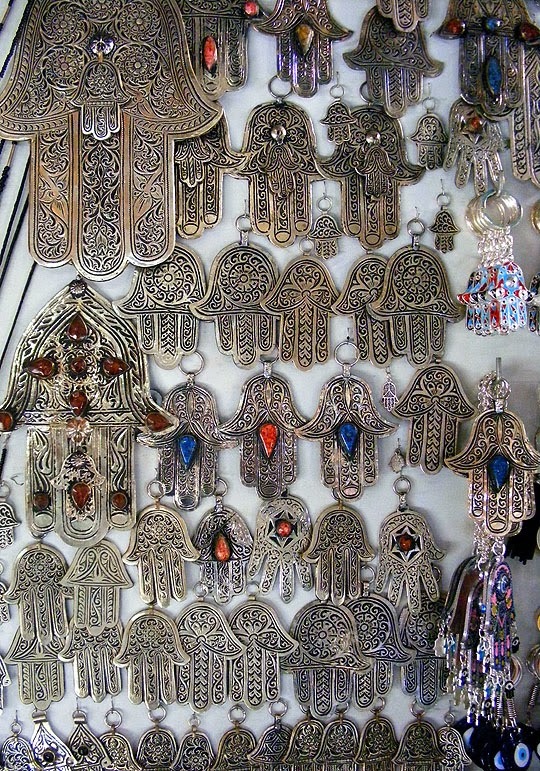 Looks like there's lots of red and orange and cats in Morocco. Sounds like a cool place. There are tons of cats of every color! :) Cats everywhere. And yep, the mountains are huge, and the weather has been so nice compared to a lot of the world right now! You ought to make a cat post. I heard (or read on your blog??) that Rome had lots of cats too. I'd rather like to see a Cats of the World post. 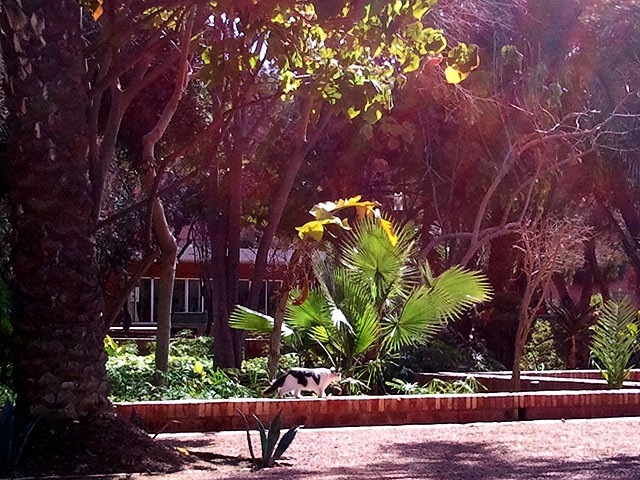 Dying at the cats everywhere - that makes me think so much of Israel. UGH I WANNA GO EVERYWHERE.